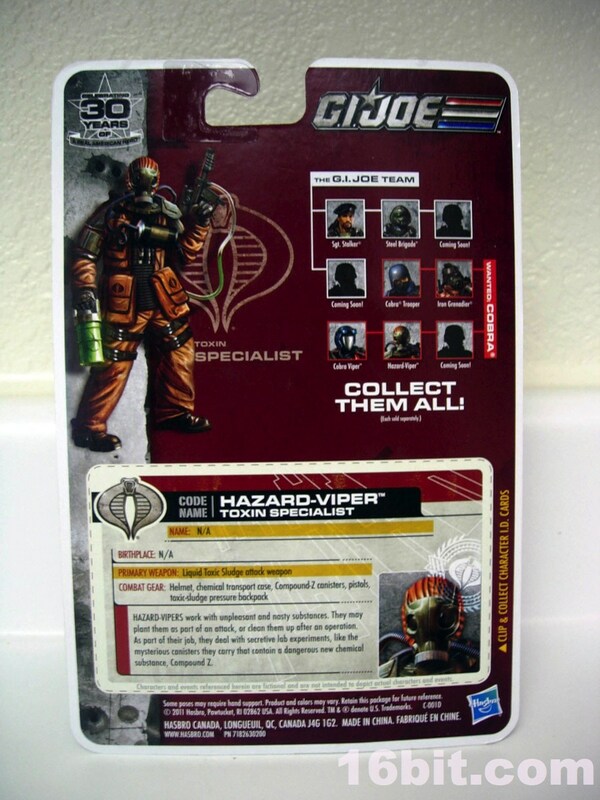 Ever since seeing the Volcano Viper in 2009, I was looking forward to getting the mold-- which kept getting delayed, and eventually became a de facto Ross exclusive in the USA. 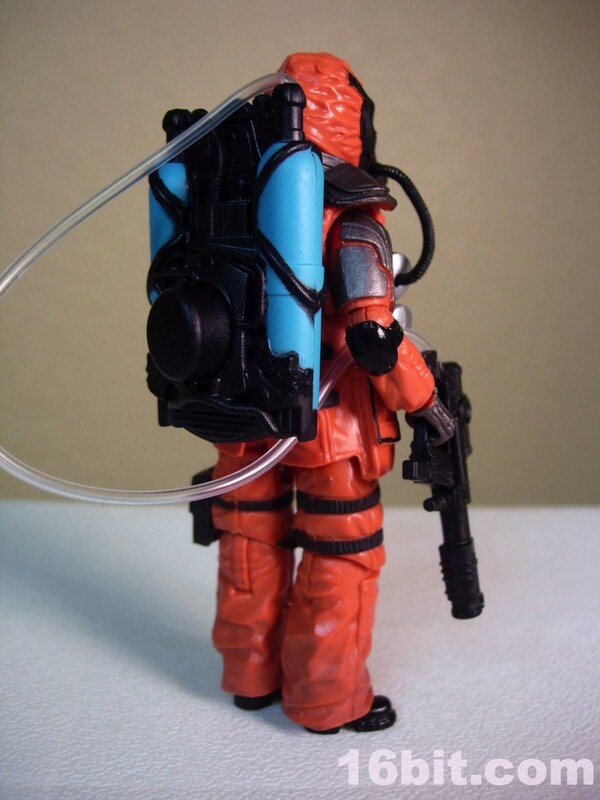 Around that time I found Hasbro was repainting it as the far more appealing bright orange Hazard-Viper which took the pilot and added in some of the Arctic Destro's gear. The end result is a bulky, bright, and mean looking guy who comes complete with a briefcase full of Chemical Z, which is Cobra's latest scary perversion of nature. 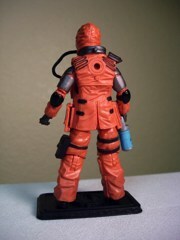 Standing at about 4-inches tall, the figure is on par with a lot of recent toys as it was originally developed for release in 2009. 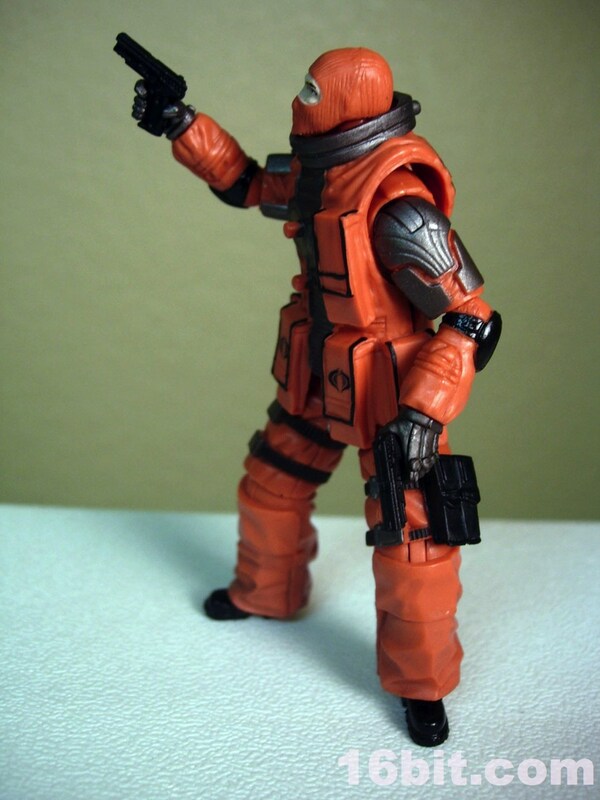 In orange, he takes on a much more poisonous look as nothing says "hands-off" like a crazy bright color. 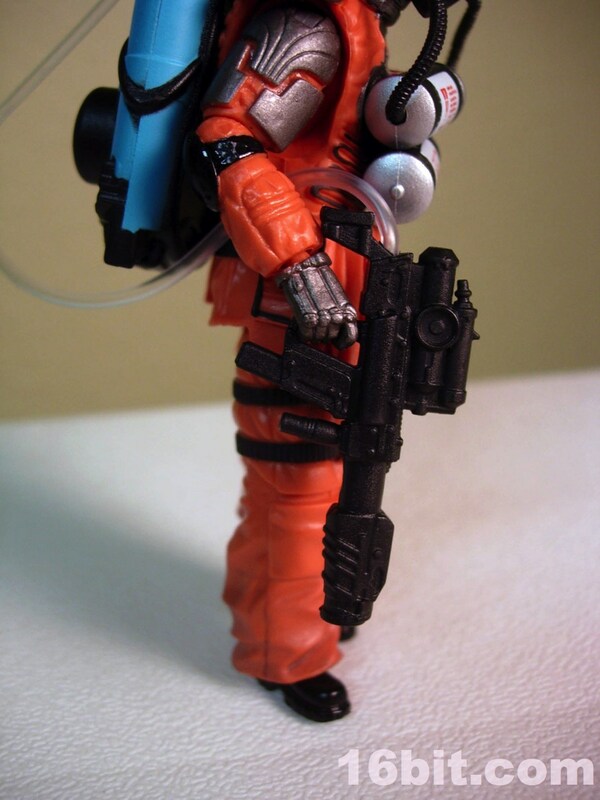 With his bulky suit he's not incredibly capable of sitting, which is unfortunate as he was originally developed as a pilot for a repaint of the Mole Pod. 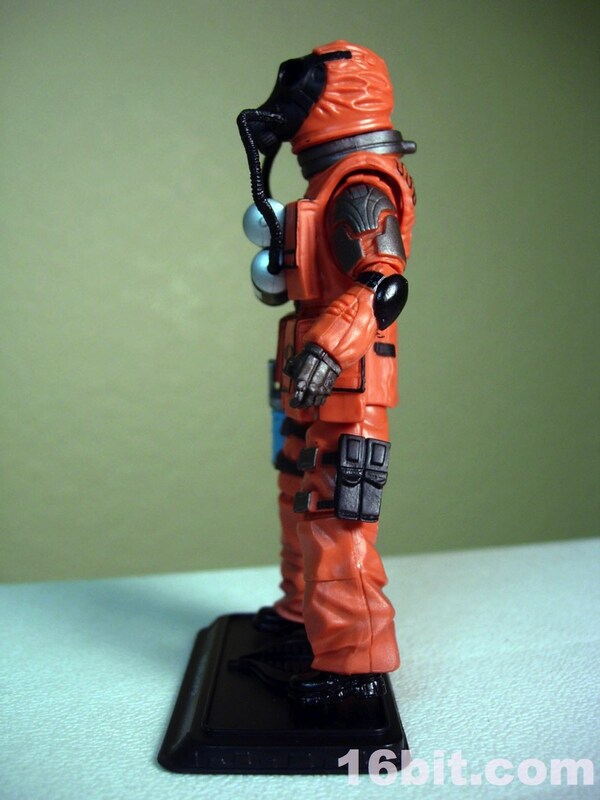 This guy isn't going to be much sitting, but he stands just fine and his ball-jointed knees are fantastic at moving in any direction you might want. 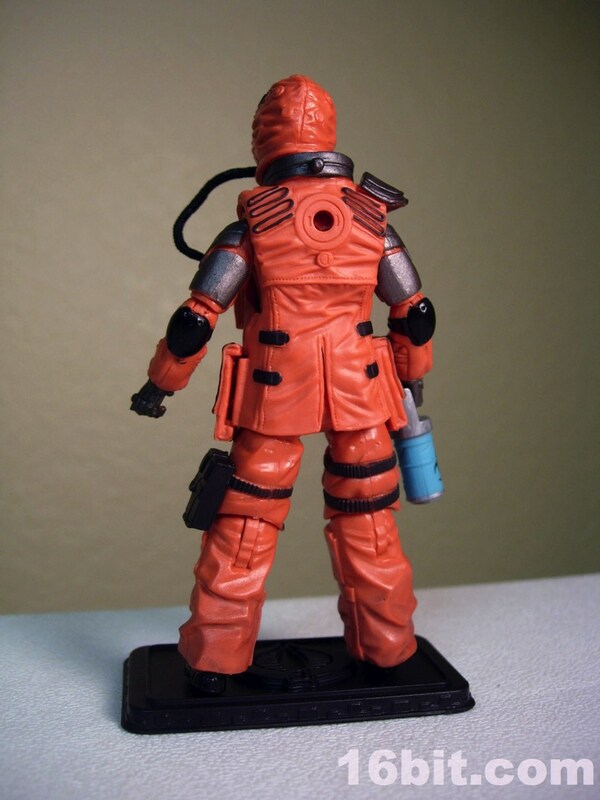 14 points of articulation are usually enough to get whatever movement you want out of a figure, but his bulky suit gets in the way-- so you're trading range of movement for an aesthetic you rarely find elsewhere in the Joe mythos. 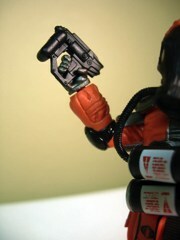 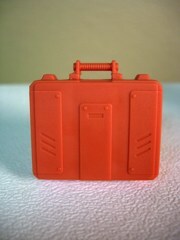 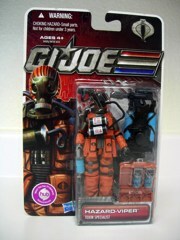 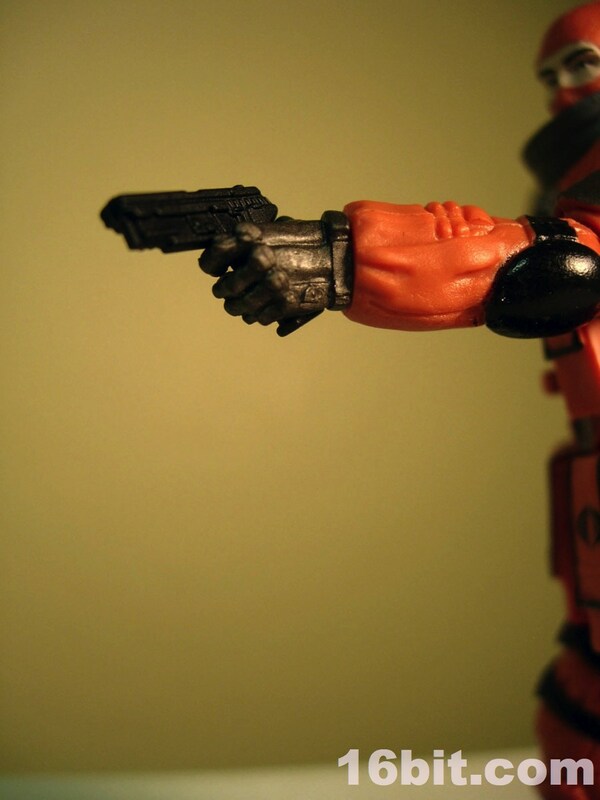 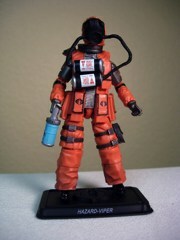 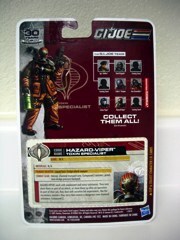 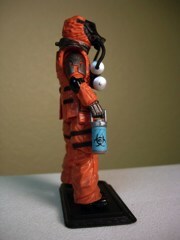 The figure is primarily orange, with a few grey and black elements plus the obligatory Cobra symbols. 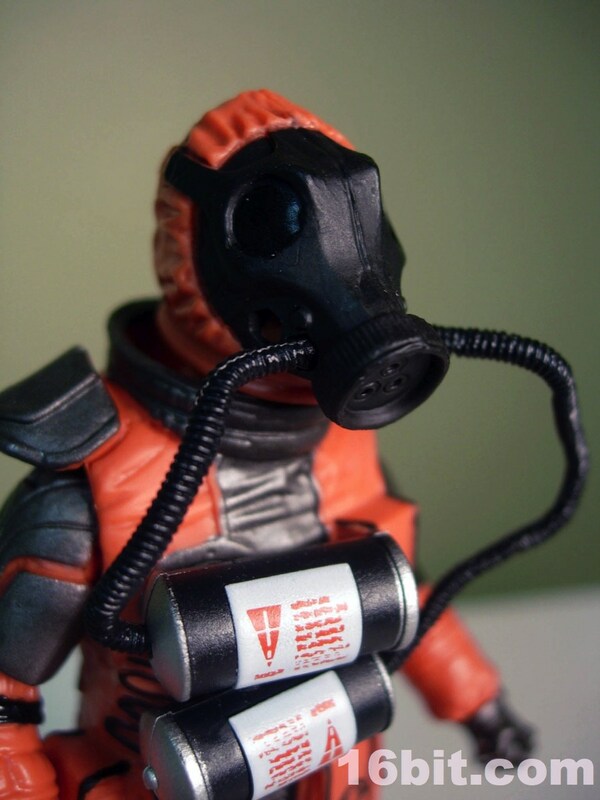 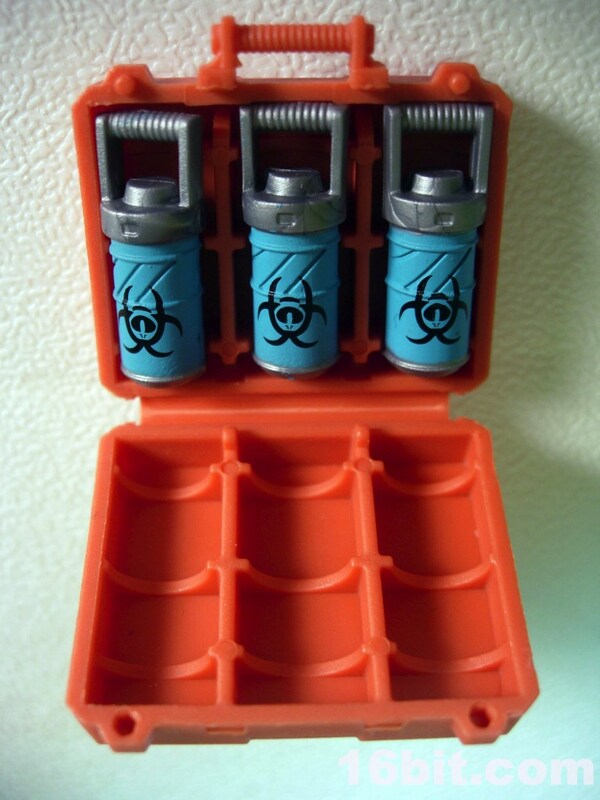 Both are small and on the figure's belt pouches, and as added deco there are some warnings on the canisters worn on his chest. 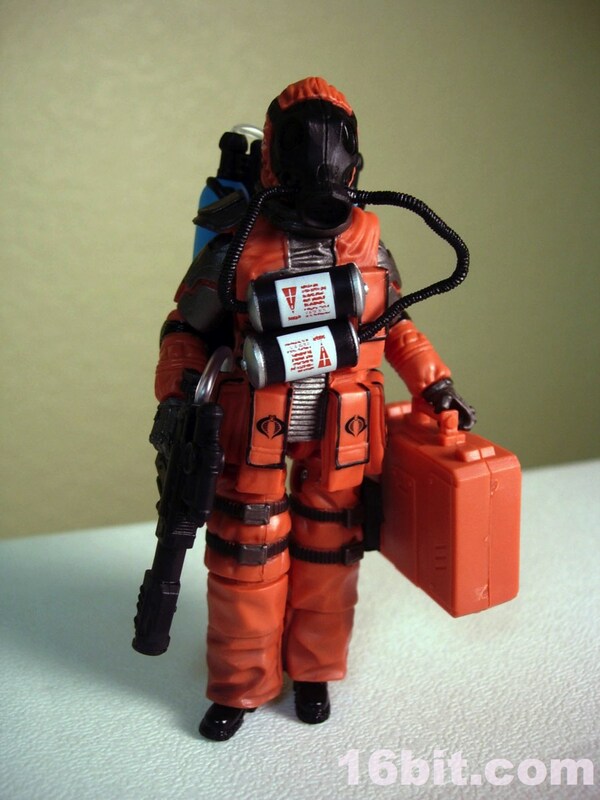 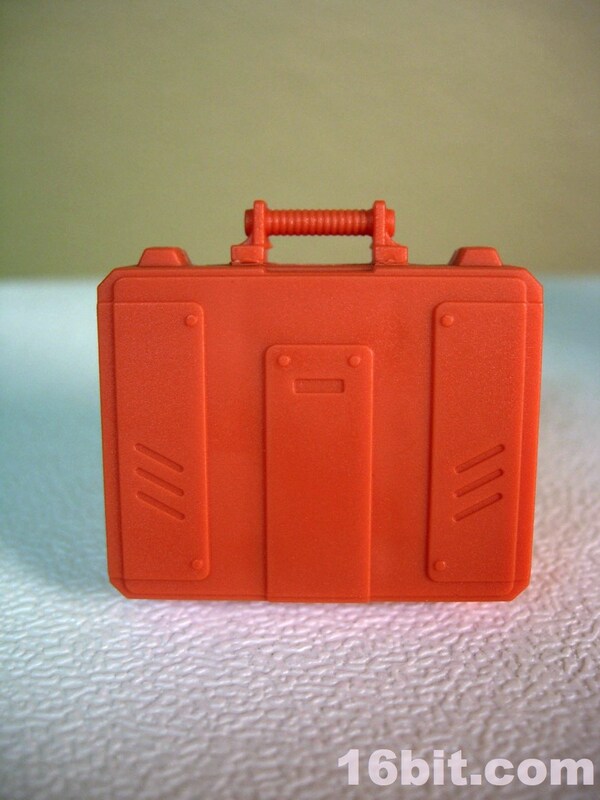 While I'd love to have seen giant hazard symbols on his person or his briefcase, it might come off as goofy given his orange coloring. 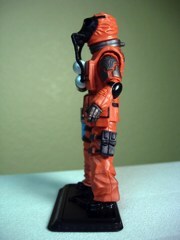 Still, it's a nice figure. 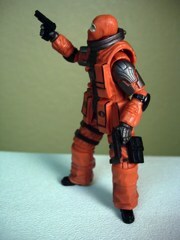 I should note that the removable mask can be tucked under a lip on the collar of the suit, but it takes some doing. 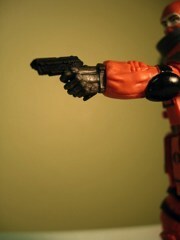 It was not photographed in that position. The figure is an interesting and clever reuse of existing parts in Hasbro's tooling library. 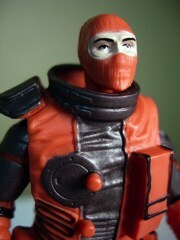 The figure came from a limited release vehicle, and most of the accessories come from Arctic Destro of 2010. 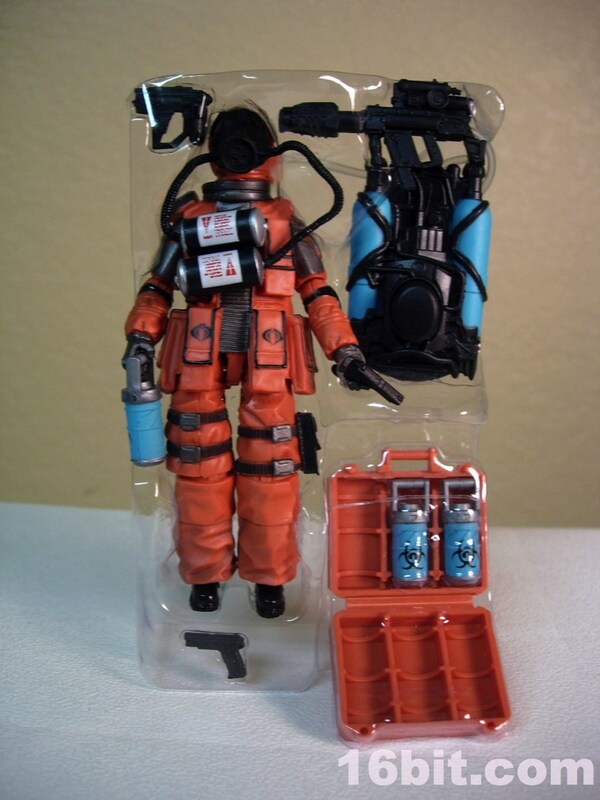 The squirting backpack and the larger of the small pistols started life as cold weapon gear for the weapon supplier, and while I can't pinpoint the origin of the pistols I'm fairly sure they've been packed with other figures before. 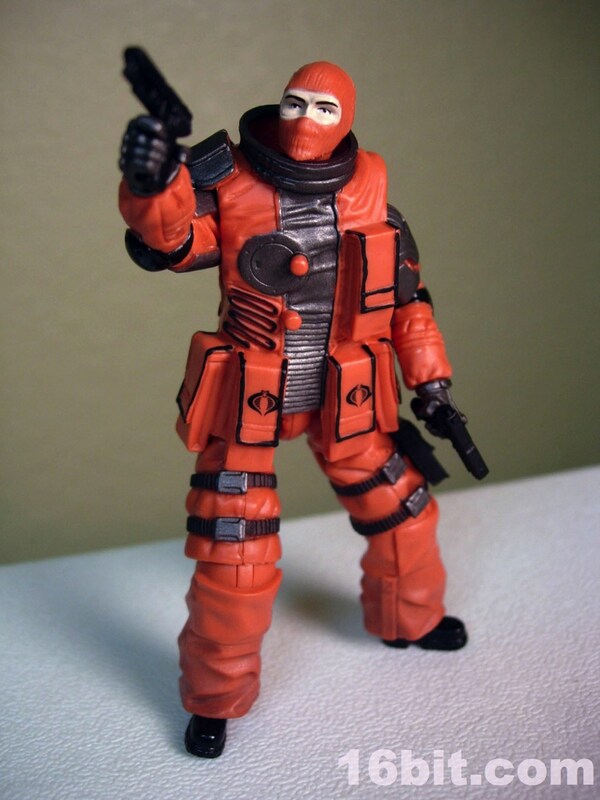 This is, of course, sensible given one would assume Cobra buys in bulk and I don't think any faceless grunt is generally going to be assigned his own specially designed gear... but maybe they do. 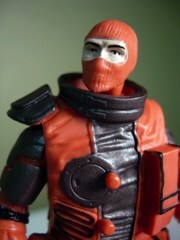 Perhaps that's part of the allure of signing up for Cobra in the first place beyond a great dental plan. 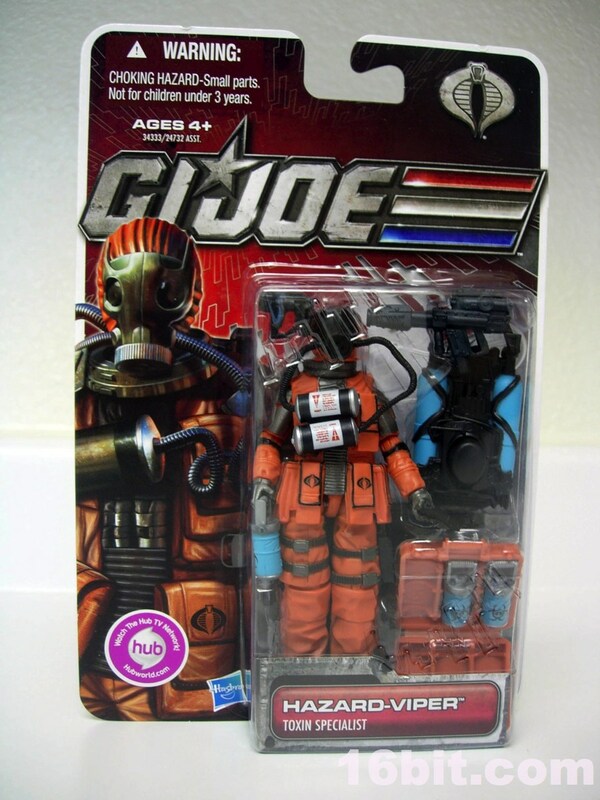 If you want a pilot for a vehicle, skip this one. 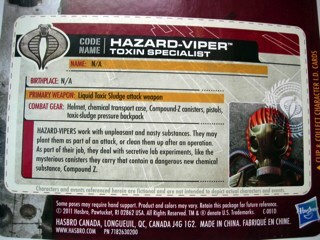 As a gunner, a guy cleaning up messes, or an addition to a diorama the Hazard-Viper is sure to please! I've got him on my desk and we're having a great time. I'd love to see the suit tweaked and reused to make a new Secto-Viper, but I assume that's probably never going to happen. 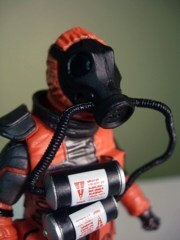 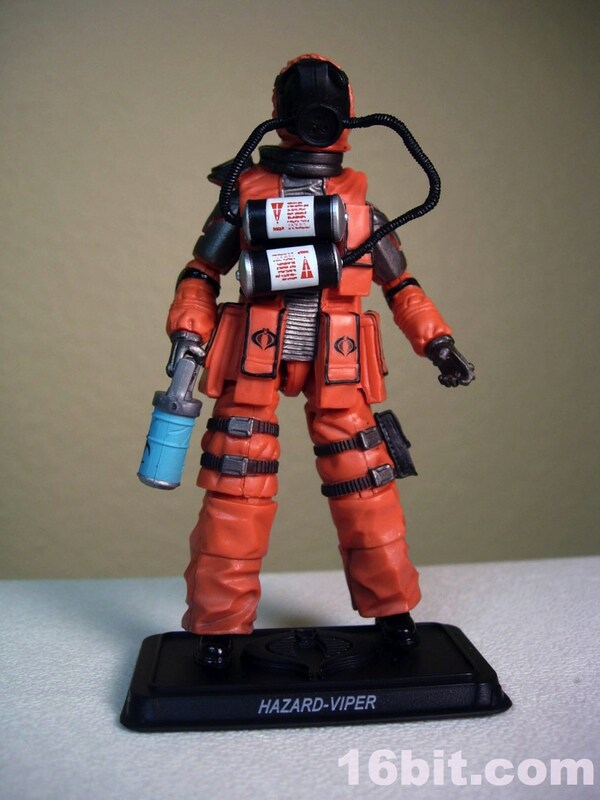 I love bright orange things, so I'd say this is a good figure for all your, uh, toxic terror toy needs.